We've been given a truly golden opportunity to run our first ever Youth Environmental Ambassadors Program in collaboration with Students On Ice, on their arctic expedition this July. There will be about 80 high school students on the expedition and we'll get the opportunity to deliver our environmental education program to them. But we need your help! We need to raise the funds to cover our costs on the expedition. So we've just created an IndieGoGo crowd funding campaign. We'd be so grateful if you could make a donation to our campaign. There are perks for each level of donation so you'll get something to say THANK YOU for your support. Click on the image of our campaign website to visit our campaign webpage and donate. And please pass the link on to all of your friends, family and colleagues. :o) The farther we reach out to people for support, the more likely we are to meet our funding goal. "Our mission is to catalyze a better way of doing business for the wellbeing of people and planet". This is the mission of the B Team, a team of influential business leaders from around the world. The initiative was created by Sir Richard Branson and Jochen Zeitz, as a means to 'screw business as usual' and create a world where people and planet are as important as profits. The bottom line of this initiative is sustainability. Getting us back to living off one planets worth of resources. It's a lofty goal and one that will be met with plenty of opposition and resistance. But it HAS to happen. The world needs a new generation of thinkers and doers - young people who know that our current model of doing business as well as our current lifestyles in developed nations is simply not sustainable. This is one of those monumental and fundamental changes that will be huge. It means we're in it for the long haul. But I'm optimistic. One of the core component of our program here at BIOSPHERE Environmental Education is to educate youth about our planet - about the incredible beauty of its diverse habitats and species. But we also look at the human impacts on our planet. The goal is to understand those impacts and to learn to change the way we live, work, and play so that we can have good lives, but not at the cost of the destruction of the earth's climate, habitats and species as well as the cost to human health and wellbeing. It is time for change. BIOSPHERE Environmental Education will be part of that change. Our goal is to inspire youth to understand and appreciate our natural environment and develop a sense of stewardship towards it. Have a wander through our website to see what BIOSPHERE is all about. We're just starting out. But many big things started out small and we're are only just getting started. Connecting people to nature and inspiring them to care about it and protect it. Youth environmental leadership expeditions and protecting the environment through visual storytelling. In November 2018, Shelley has the honour of being part of a 3 member panel, along with Canadian astronaut, Bob Thirsk, and Ingenium Women in STEM Innovation Award winner, Marianne Drolet-Senechal. With 80 Ottawa high school students, we discussed how failure is not a bad thing, that it is an essential component of life from which we learn and gain experience. Our panel discussion on failure at the museum of science and technology in ottawa in november 2018. Listen to our latest interview with our local radio stations, Lake 88 radio in Perth, Ontario. The wonderful Lynda D’aoust hosted us to speak about women and girls in science and about our upcoming Youth Environmental Leadership Expedition, July 1-14, 2019. We are accepting applications now. Sandra shaw and shelley ball, after our interview at lake 88. How passion, grit, and resilience can take you from ordinary to extraordinary. 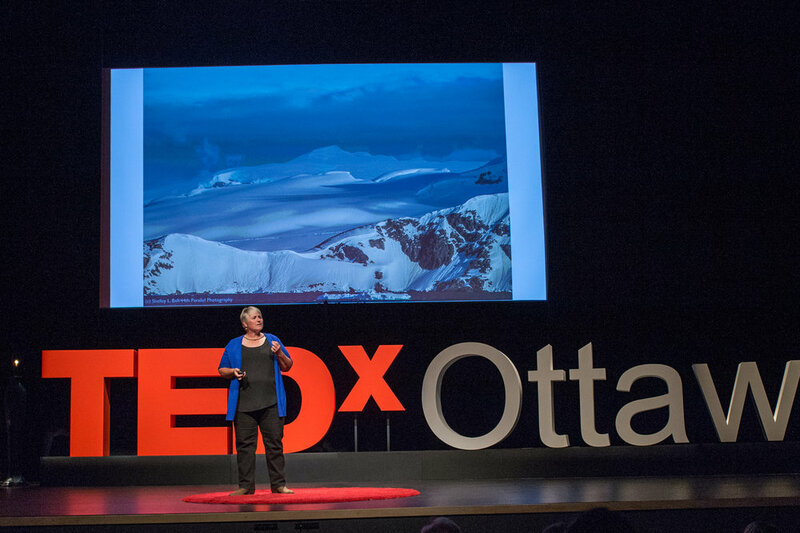 click on the photo to watch shelley's ted talk. Watch our new Video Vignettes! 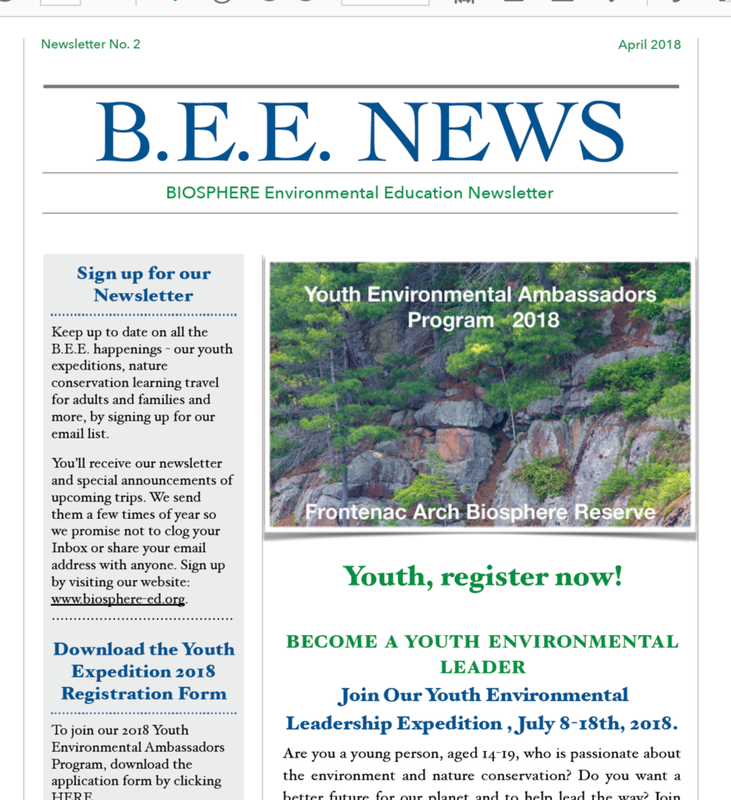 Biosphere's founder, Dr. Shelley Ball, talks about the Youth Environmental Ambassadors Program - an environmental learning expedition for youth that inspires youth to care for the environment through travel, discovery, photography and video. Copyright Biosphere Environmental Education Inc. 2019. All rights reserved.